I purchased a voucher off Groupon or Scoopon some time ago. 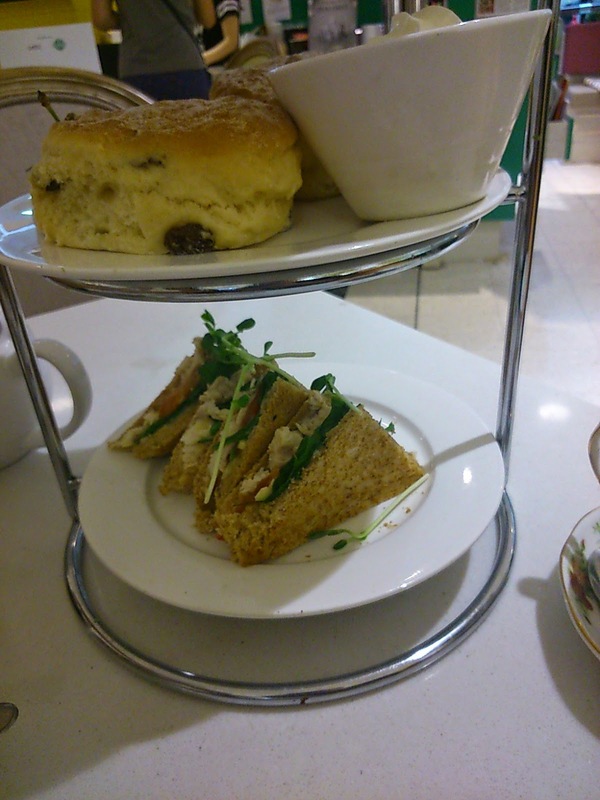 I couldn't pass an opportunity for high tea at the low cost of $25. I am over paying $50pp for some sweets and sandwiches! 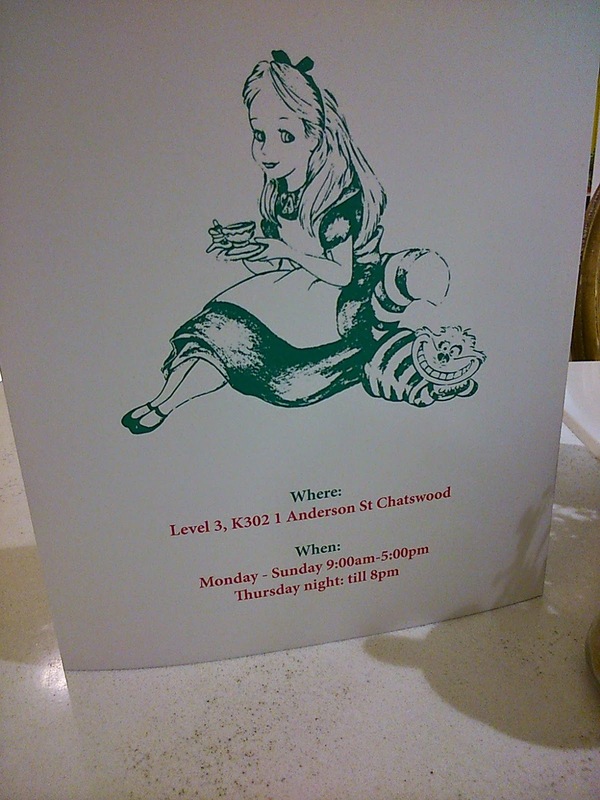 This cafe is located smack bang in the middle of Chatswood Westfield. An open plan design, allowing wild-lings, aka other consumers/shoppers to use the gap between each table within the cafe as a pathway to their next destination. 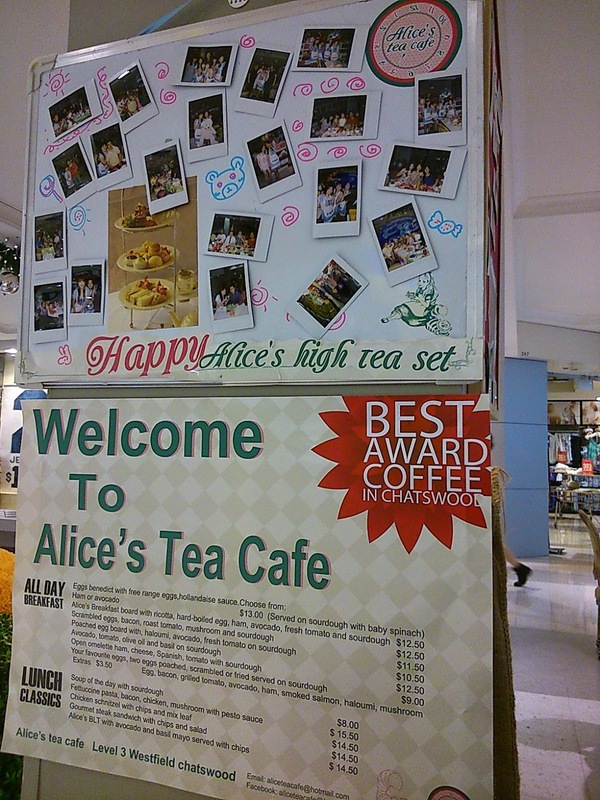 Alice's Tea Cafe is Alice in Wonderland themed - mind you, I now regret not eating at the Alice in Wonderland themed restaurant in Japan. The Cafe had giant teddy bears and giant chess pieces as decors. You'll find a picture of Walt Disney's Alice at the back of their menu... I sure hope they have copyright. 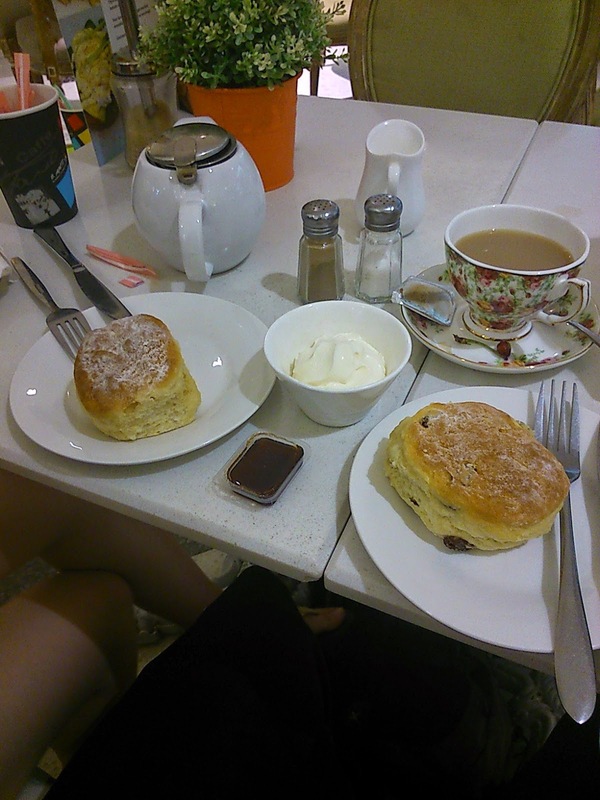 So that was our High Tea for 2. I liked the fact that you can waltz in on a weekend and demand high tea instead of having to pre-book. Base Tier we have our poached chicken sandwiches on brown bread - TICK. This was nicer than what I imagined, in comparison to The Tea Cosy - this was significantly TASTIER. Second Tier is the home to two scones. 1 raisin and 1 plain. Initially I thought, they're scones, you can't get them wrong... it's flour and lemonade! Oh I was so wrong. These scones were quite awful. Very dough-y very chewy and kinda sticks to the roof of your mouth. Jam was out of a packet..... disappointing..... the cream evaporated as soon as I dug my knife into it... double disappointing. 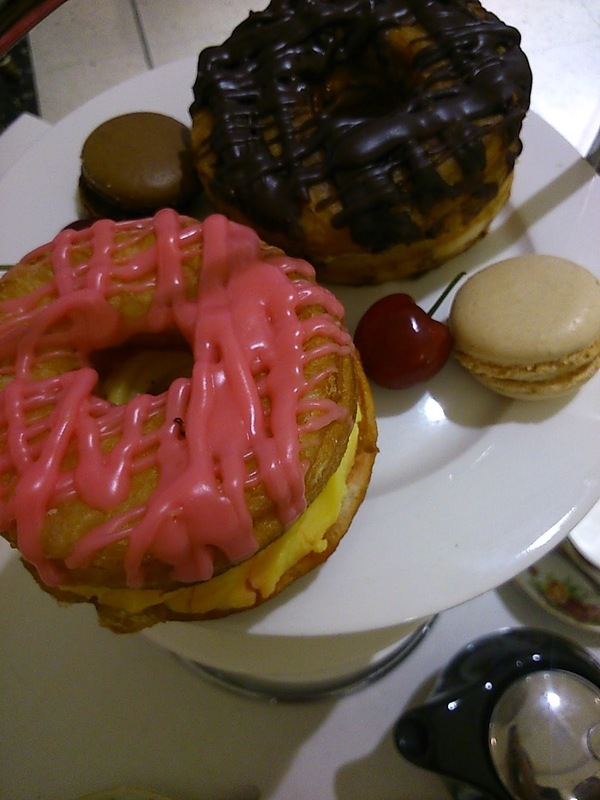 Top Tier was very exciting, we have our custard filled strawberry and chocolate glazed cronuts. First time trying cronuts and two thumbs up. It was as diabetic as I have expected it to be. The macarons were great, much better than the ones I made, which looked like raw steak. 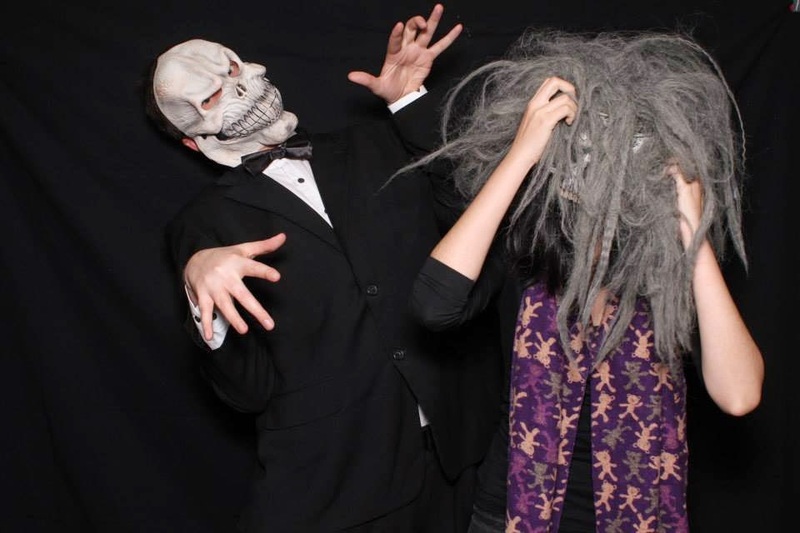 We knew something wasn't quite right there. 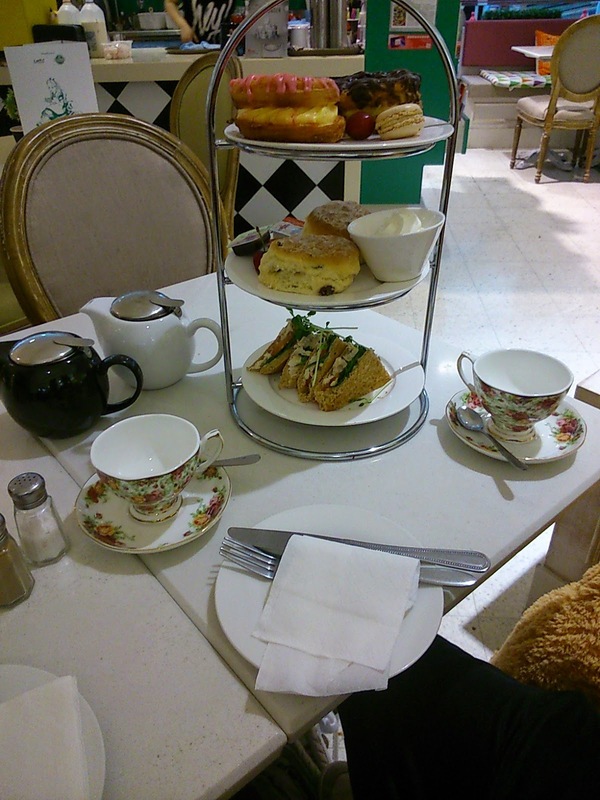 Probably won't be going back, there are a number of high tea venues I'd like to try out. This was rather medicore to be honest, I would've been huffing and puffing if I had to pay $50 for this... Thank goooooddness for discount vouchers!